Excretion is the removal of waste products of metabolism from the blood. The excretory system is made up of the urinary system and a number of other organs and systems that contribute to the excretion of waste products. But the most important part of the excretory system is the Urinary system. The urinary system eliminates excretory products in the form of urine. The excretory products released include, CO2, urea, uric acid and other substances. It is necessary to keep the body’s vital functions in balance. It regulates the amount of water in tissues (water homeostasis), the concentration and type of mineral salts in the blood and the blood’s pH levels. The kidneys and their blood vessels are located in the abdomen. They constantly produce urine which then passes to the bladder. They are well adapted to enable them to carry out these processes. 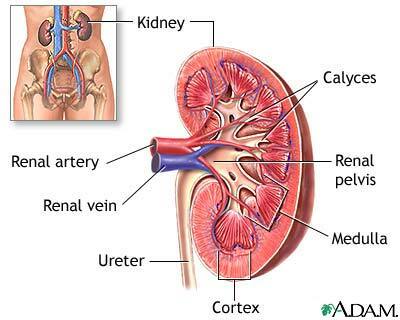 Each kidney receives a good supply of blood at high pressure through the renal artery. Each kidney contains hundreds of thousands of tubes called nephrons which filter substances from the blood. The functional unit of the kidney is the nephron. 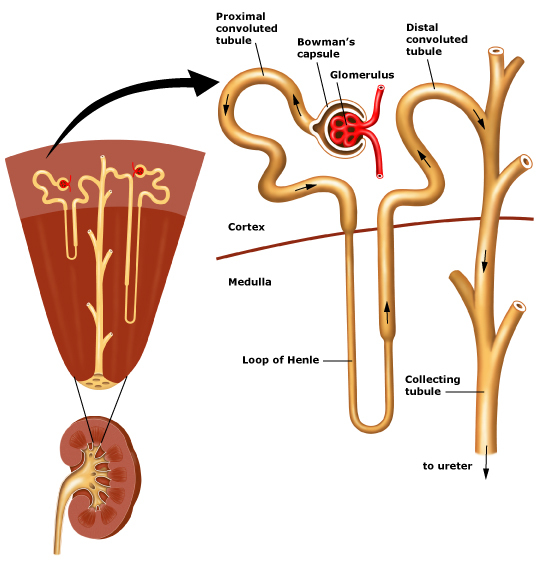 The nephrons are small tubes surrounded by blood capillaries which filter the blood and produce urine. Bowman’s capsule. This is the first part of the nephron. It is a round sac which contains a curled-up capillary called the Glomerulus. Convoluted tubule. This is a long, twisted tube with two distinct sections: proximal and distal tubule. Loop of Henle. This u-shaped portion of the nephron is located between the proximal and distal convoluted tubes. Where in the kidney is blood filtered? Can you explain the process? Ureters: these two narrow tubes, around 28 cm long, connect the renal pelvis of the kidney to the urinary bladder; an elastic sac where urine is stored before it is expelled from the body. Urethra: this duct leads to the outside of the body. At the beginning of the urethra there is a sphincter which stays closed as long as the brain does not send a nervous stimulus to open it (the micturition reflex). Draw and label the urinary system. Define the concept of excretion. 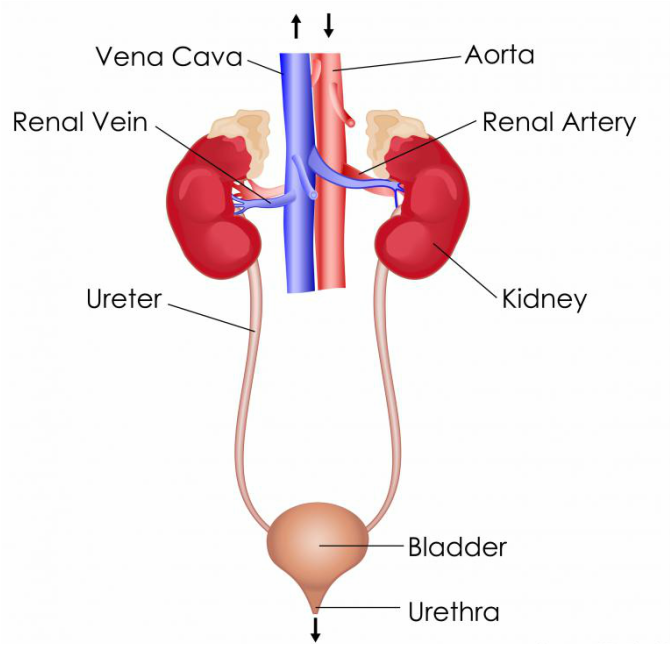 Define the function of the ureters, bladder and urethra. Does the urethra have any other functions? Glomerular filtration (ultrafiltration): In this phase certain substances in the blood in the renal corpuscle pass through into the Bowman´s capsule. This process filters the water and most other soluble substances circulating in the blood plasma. Tubular reabsorption: As they travel through the nephron’s tubule, a lot of the filtered substances are reabsorbed, meaning that they go back into the blood in the surrounding capillaries. These substances include nutrients (glucose, vitamins, amino acids, etc). Some water and mineral salts are also reabsorbed to keep their levels in the blood constant. Water molecules are reabsorbed in the loop of Henle while other substances are reabsorbed in the proximal tubule. Waste products are not reabsorbed. Pickering, W. (2006). Complete biology for IGCSE. Oxford (England): Oxford University Press.